We’re lucky to have several staffers who have either gameday assignments at Ohio Stadium or season tickets. After each home game, we’ll get you some quick thoughts “from the cheap seats”. As I awoke around 3:30am Saturday morning, my excitement for what the day held overtook my desire and need to go back to sleep. It would be three short hours until I’d begin my two hour journey south to Columbus. As I arrived in Columbus with my family and friends and plotted our route from the Ackerman lots to our traditional stop at Conrads for our game day “beat Buffalo” buttons and then on to the Skull Session, I found myself with a sense of joy and giddiness knowing the 2013 Buckeye season was less than three hours away. We took our seats at St John’s Arena and begin our annual bet of who’s going to speak before Urban at the Skull Session. The guesses ranged from Jordan Hall to Corey Linsley to Christian Bryant. We were all wrong as Garret Goebel grabbed the mike and began to get the crowd ready. As he handed the mike to Urban after speaking, I thought to myself, will he tie in something regarding “the journey” of which he spoke of many times last year. He didn’t disappoint ending by talking about “a new journey begins today”! There are numerous times in the life of a blogger that you just wish you had the opportunity to cover a football game like the local media in Columbus. Let’s face it, for the most part, those of us who are online entities just do not have the chances that the O-Zone does. They have some of the best writers covering Ohio State sports and do a good job of delivering the facts, and have a legacy of doing so. If you were paying attention to twitter at all on Saturday, with the help of Brandon Castel and Tony Gerdeman, we got our information through RT’s and a heaping spoon of sarcasm. I have to be honest and admit right up front that I love the OZone and what they do. I frequent their message board and read a lot of their stuff and wouldn’t be honest if I said I didn’t wish I was in their shoes. 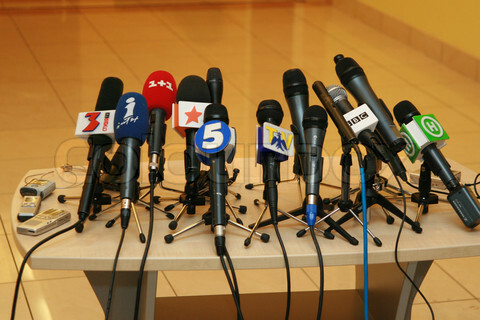 What happened Saturday to the local media was very interesting, and seemed to be a slap in their collective faces. It seems, and I am not sure why it happened, only the Big Ten Network and ESPN have been given permission to cover the team during this preseason- at least in comparison to other years. I for one wasn’t very happy about it and can only imagine how the Ozone felt about it. If you’d like to get a good idea of how Gerd felt about it you can read it here. Online sites seem to almost always be on the outside looking in when it comes to getting first hand information as it is delivered. We do have people writing that have contacts in the recruiting realm, and that can sometimes be a huge plus since other times everyone else is receiving the same info at the same time and from the local guys. We do our best to put it in a great little package and most of the time at the same level as the fans. After a 2011 season of “rotating captains” and other nonsense, coupled with a spring and fall camp that focused on competition and excellence, it’s great to see that the Buckeyes have chosen five of their team who have emerged as leaders for this coming season. COLUMBUS, Ohio – Five senior leaders have been chosen by their peers on the Ohio State University football team to be team captains in 2012. 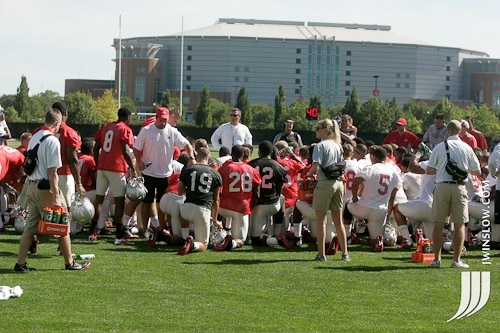 Coach Urban Meyer announced the captains at a team meeting Sunday night. 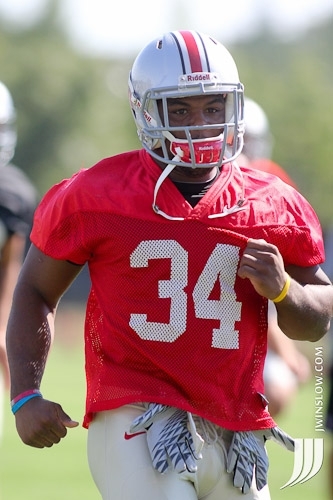 § Running back Jordan Hall, from Jeannette, Pa., and Jeannette High School. The five have combined for 185 games played and 74 starts, with four having played in 39 career games apiece, respectively, and a fifth – Jordan Hall – a veteran of 29 games. Boren leads the group with 27 starts with Simon at 26 and Goebel (13), Sabino and Hall (five each) following. Simon becomes just the seventh two-time captain in school history and the first since James Laurinaitis was named captain in 2007 and again in 2008. Ohio State is ranked 18th in the initial Associated Press Top 25 poll, marking the 24th consecutive season and the longest current streak in the country, to be ranked in the AP preseason poll. The team opens its 2012 season Sept. 1 vs. Miami (Ohio). 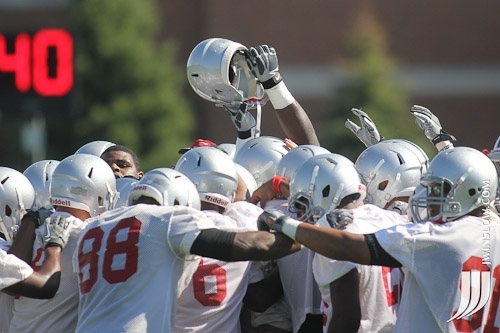 Another quick update on the state of Ohio State football, following media access on Monday. Huge thanks to our friend Josh Winslow for the photos! Doghouse Update- Brionte Dunn practiced, and Coach Meyer said that they were waiting to see how the legal process concluded before making final decisions regarding any punishment. Also, Jake Stoneburner and Jack Mewhort went with the #1 team- Meyer characterized them as “good kids, but stupid.” They will be on scholarship beginning fall semester.